The final liquidation of the Warsaw ghetto began on April 19, 1943, when the SS forces and German police entered the ghetto under the command of SS General Jurgen Stroop. The Jews, who obtained prior information about the operation, went underground and some of them turned to armed resistance. The campaign to wipe out the ghetto continued until May 16, and ended when the Great Synagogue was blown up. During the operation, at least one photographer accompanied Stroop’s headquarters, and he took some 115 photographs. Of these, Stroop placed 48-52 pictures in his summary report of the ghetto liquidation, which was entitled Es gibt keinen judischen Wohnbezirk in Warschau mehr (the Jewish quarter in Warsaw no longer exists). Three elegant copies of the report were produced. One was sent to Himmler, one went to Krüger (the supreme commander of the SS and German police in the Generalgouvernment) and the last copy was kept by Stroop himself. This copy, as well as additional photos that were not included, were found in Stroop’s possession when he was captured by the Americans after the war. The other copies were also found and one of them was even presented at the Nuremberg Trials. The original albums are presently located in the National Archives of the United States, the Federal Archives in Germany, and the Central Committee for Criminal Investigation in Warsaw. The copies of the photos in the Yad Vashem archives came from the National Archives in the USA. 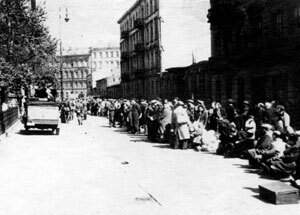 The high-quality photographs taken for Stroop constitute a unique documentation of the final stage of the history of the Warsaw ghetto. We can see that the photographer was permitted to accompany the forces that participated in liquidating the ghetto, and to get close to the main combat areas. As a result we have a close look at how the Jews were removed from the bunkers in their underground hiding places, how the buildings were set on fire, Jews who were captured, demolitions, etc. Moreover, the album contains many photos of Stroop while he was attempting to put down the rebellion – a fact that indicates his desire to sing his own praises through the photos. Added to the photos contained in the album are short descriptive captions in German, and they clearly reflect the racist perspective of the report’s author. Stroop’s photographs serve as an extraordinary visual testimony to the brutal end of the Warsaw ghetto.